If you want to know how your mixes match up to commercial masters, Harbal will show you! The Harbal mastering software has been around for more than seven years now, and its first release version was reviewed by Martin Walker back in SOS March 2004. However, although it had evolved significantly into version 2 by 2006, development seemed to have stalled by the time I started using v2.3 regularly in 2009, and I recently began to worry that OS updates might force me to put this tremendously useful utility out to pasture. It was with a sense of relief, then, that I greeted the news of an all-new Harbal v3, which overhauls both the program's internal coding and its user interface, as well as making it available to Mac users for the first time. Before I dive into the new features, let me first provide a quick overview of where the software stood as of v2.3, for the benefit of anyone who hasn't yet encountered it. A stand-alone application, its single-window interface was dominated by a large, multi-function display area which was used to display cumulative frequency-response and level statistics for an entire stereo mix file, derived from peak and/or averaged signal levels. The frequency response could then be tweaked with minimum- or linear-phase EQ tools, while one made visual and auditory comparisons against a simultaneously loaded-in reference recording. Equalisation changes were loudness-compensated to discourage our natural bias towards louder settings, and there were also tools for automatically or manually reducing the loudness of your reference to match that of the file you were processing, working in concert with a simple one-slider output limiter. Alongside these core features were a number of more complex 'fairy dust' facilities. In addition to a fairly simple EQ ripping facility which mapped a reference track's spectrum onto your own, there was the automated IntuitQ routine, which evened out spectral imbalances in a (usually) fairly subtle process that made most mixes sound clearer, smoother, and more polished — whether or not that was artistically appropriate! The HB Air function provided a different euphonic effect via a short stereo ambience signal, transparently lending mixes a flattering, breathy sheen and expanding the image width, assuming you applied it with a light touch. So much for past glories; what's new? For a start, there have been a raft of small usability improvements, which make the system quicker and easier to work with. The key to these is the new level timeline display running across the top of the window. Like the main window, this features peak and average contours, and you can click within it to control the playback transport or to loop any section. The level timeline of your reference file appears above that of the file you're processing, and you can drag it to line up the most relevant sections of the two files when performing A/B comparisons. The filtering display has been updated with a bar-graph spectrum analyser, the frequency resolution of which follows that set for viewing the peak and average spectra. More useful for me, though, is the way you can now visually align the level of your mix with that of your reference file, but without making any actual gain changes. This makes it substantially easier to compare unmastered mixes with heavily loudness-maximised commercial releases. The first big operational development is a newly coded EQ engine which allows you to set up an EQ filter not only for the whole stereo file, but also for its separate left and right channels and for its Middle and Sides signal components. You can now apply separate EQ curves independently to the left and right channels of a stereo file, as well as to its Middle and Sides signal components.This provides considerable additional precision in mastering applications, especially as regards manipulating stereo width and maximising mono compatibility. The down side of the extra flexibility is that it takes a lot longer to analyse files in the first place, and there's also sometimes a noticeable time lag between enacting an EQ adjustment and it being realised audibly. A little spinning graphic in the window's status bar lets you know this is happening, so fortunately no guesswork involved on the user's part is involved, and in practice this didn't really hamper my work, given that all the individual processing bypass switches still work instantaneously. Although the limiter in v2.3 was occasionally handy for some listening comparisons, I always preferred more fully featured plug-in mastering limiters for serious loudness-enhancement applications. However, the only visible upgrade to that aspect of the program is an activity meter, the developers having chosen to plough their resources into a much more interesting automatic volume-control routine instead. Because Harbal analyses the level characteristics of the file during load-in, its scheme does away with time constants, and evens out levels in a more 'symmetrical' way, more like an engineer with knowledge of the arrangement might do if riding a fader in real time. In other words, Harbal will reduce the level of the track before a loud level spike arrives just as gradually as it resets the gain reduction following the peak. For those of you used to dealing with traditional mastering dynamics, this might not seem like a particularly useful algorithm. Indeed, I can confirm that if you try to drive Harbal as hard as a rock mix-bus compressor or a dubstep master limiter you'll end up with something pretty lumpy-sounding. However, in its intended role of evening up longer-term level differences between sections of a mix, it actually feels a bit more natural to me, in a way that suits acoustic music particularly. It also seems to serve as a nice preparatory dynamics stage prior to the use of normal loudness processors in more mainstream pop/electronic/rock styles, enabling more consistent loudness and reducing limiter/clipper-stress side-effects. 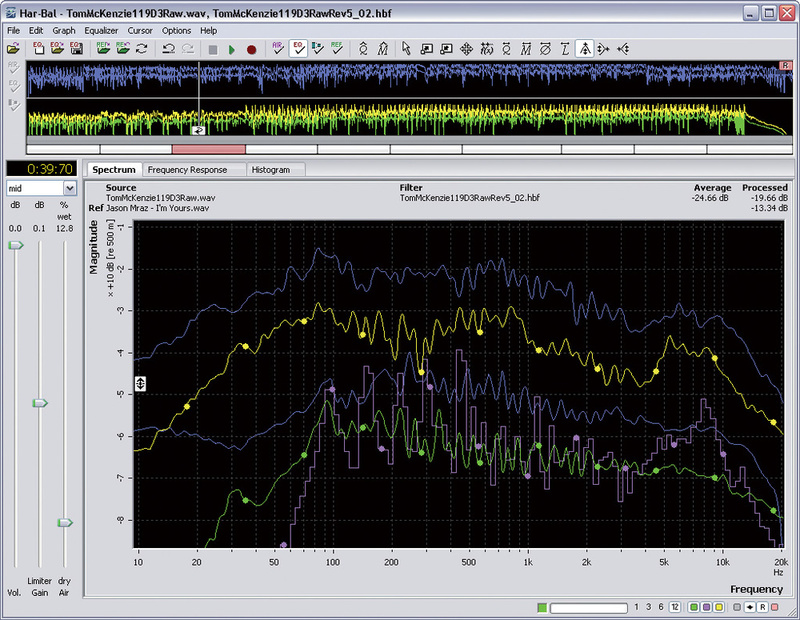 The Dynamics analysis and processing page can be seen in this screenshot. The green trace is the mix being mastered, while the dark blue trace shows the dynamics profile of a commercial reference track — the three white processing 'nodes' are adjusting the former to more closely resemble the latter. The interface takes a little getting used to, based, as it is, around a statistical histogram of peak and average signal levels. However, although the display seems rather alien to start with, it's not too difficult to get the hang of: the main thing to realise is that the taller, narrower and more right-aligned the little 'mountain' in the display, the narrower your dynamic range. Once you have got used to reading the histogram, you'll find that it does clearly reveal the dynamic characteristics of different mixes, particularly when you compare tracks from different commercial productions. Altering the dynamic range on this display involves using a special tool to stretch your little histogram mountain to the required position and dimensions, leaving rather complicated-looking branched 'nodes' behind to show what you've done. Despite the best efforts of the supplied documentation, smoke may start issuing from your ears if you think too hard about how these changes relate to traditional compressor threshold/ratio curves, but taken on its own terms I actually found this facility both powerful and fairly intuitive. That said, I was initially hampered by annoying display bugs in the review version (some active nodes remaining invisible, and some inactive nodes remaining visible), which made it confusing to go beyond fairly straightforward settings, but fortunately the software's developer, Paavo Jumppanen, was able to fix this with a software revision before I finished my review. The final headline feature of this update is the ability to change the processing to match changes in a mix you're mastering. This is achieved by a system whereby user-defined Split Points divide the track into Segments, each of which can have its own EQ, HB air and dynamics settings. You can zoom in on the main level timeline to set the Split Points as precisely as you like, and transitions between Segments are smoothed internally to make them less obvious. The smoothing duration only sounds like a few tens of milliseconds, but you do still have to be a bit careful where you place your Split Point if you're making any drastic changes between settings. There's no obligation to use Segment-specific processing at all, of course, but if you do, it's applied as an offset to whatever global processing you've set for the whole file. This is just as it should be, because it means that you can make lots of fine, localised tweaks and still have the ability to apply, say, a little more high end or a little less limiting to the whole master. The moment you start working with Segments, it quickly becomes apparent that it'd be useful to have a method of copying filter settings between them — so that you could start work on one chorus based on the settings you've already used on another, for instance. This is achieved by assigning a Reference Segment, which then displays its spectrum, EQ curve and histogram in a different colour alongside those of whichever Segment you subsequently select. You can then either use the Reference Segment's traces as a visual template, Shift-clicking the Segments in the scroll bar to switch between them, or paste those settings to replace the current Segment's own. 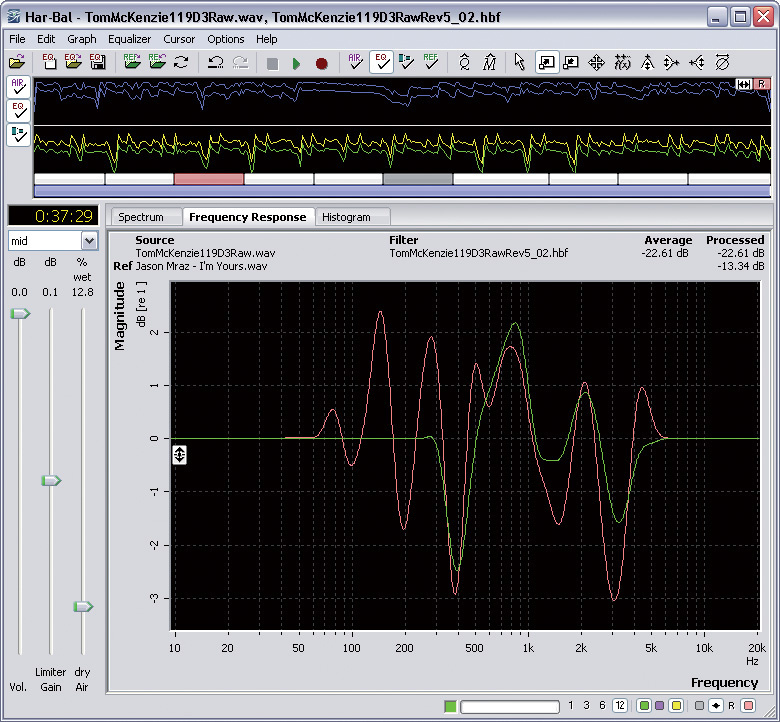 The two EQ curves in this screenshot are from different Segments of the mix. 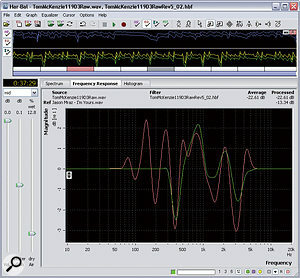 The green curve shows the current Segment's EQ settings, and the red curve shows the settings of a designated Reference Segment, which can either be used as a simple visual reference, or can be pasted in place of the current ones. The idea works pretty well as it is, but there's still some room for refinement here. Although global copy/paste seemed to function pretty well and featured options for pasting subsets of parameters, there still seemed to be no way of pasting a dynamics setting without also overwriting the EQ curve, for instance. I'd also have liked a way of naming Segments. And while I'm on the subject of niggles, I missed a gain-change display to show the actions of the main dynamics module, and would have appreciated it if the Edit menu had provided some information about exactly what you're undoing/redoing, as many other programs do. In my discussions with Paavo, he also mentioned that audio files containing significant periods of digital silence (such as individual tracks from a multitrack session) can cause the peak and average spectral displays to diverge to an unworkable extent. While this was certainly true when I tried it, I didn't suffer any operational problems at all when working on normal mastering-style applications. However, if you insist on processing separate instruments with Harbal (which the dynamics routines in v3 do admittedly make significantly more enticing), you can actually work around this issue by isolating the silent parts into their own Segments, whereupon the analysis in the non-silent segments seems to work just fine again. If you're an existing fan of Harbal v2, I can't think of any decent reason not to upgrade. The visual information it provides remains just as useful for mastering and mix-referencing purposes as it ever was, and the latest version's interface improvements already justify the $30 fee on their own. That you get M/S processing, a type of snapshot automation, the revealing histogram dynamic-range display, and a flexible automatic volume control routine then feels like a bonus, so it seems distinctly churlish to look such a gift horse in the mouth. For potential first-time purchasers, however, the software's calling-card 'visual EQ' function may not have been enough to convince them to part with their cash thus far, in which case the power and usability of the additional functions become a more important consideration, especially when the pricing puts Harbal in direct competition with IK Multimedia's all-in-one T-Racks 3 mastering bundle, and not much below Izotope's feature-tastic Ozone 5 suite. In this respect, I think Harbal's Segment-based processing and new dynamics options still give it a unique edge, although it could benefit from a few interface and usability improvements, even beyond the welcome updates implemented during the review period. For my own part, I continue to use Harbal on a daily basis and firmly believe that its uniquely specialised audio analysis and processing tools make it well worth the price tag. I've already mentioned that IK Multimedia's T-Racks 3 and Izotope's Ozone 5 can be had for around Harbal's price, but it's worth bearing in mind that these aren't actually directly comparable with Harbal. Yes, all three packages have EQ and dynamics processing, but Harbal's take on both is rather different in terms of visual feedback and operation — I'd say complementary in some ways, in fact. In the past, Harbal has also been compared with various 'EQ ripper' programs such as Voxengo's Curve EQ and Apple's Logic Match EQ, but that comparison isn't very apt either, because EQ ripping is only a small part of what Harbal can do, and not the most useful part at that. As such, I think a decision about whether to buy Harbal turns more on whether it's worth the money on its own terms than on whether Harbal is better value than another product. A fantastic tool for comparing the frequency-response and dynamic characteristics of different productions during mix-referencing and mastering. The powerful automatic and manual EQ tools sound great if used sensibly, and can now be applied to Left, Right, Middle and Sides channels separately. 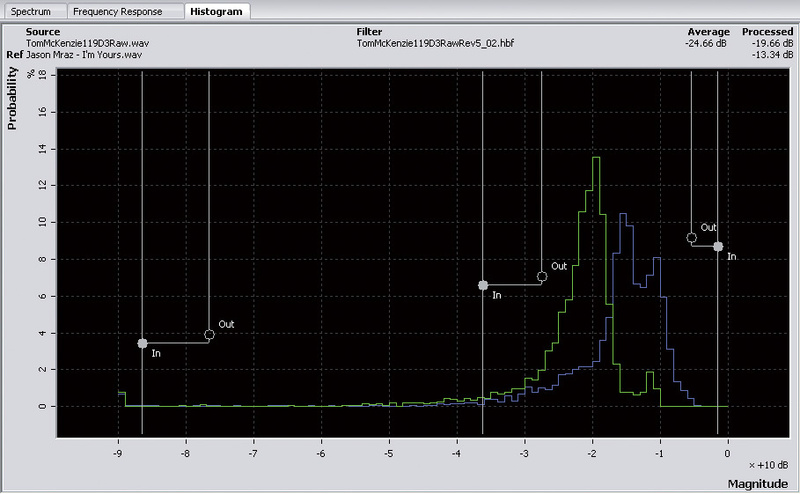 Snapshot parameter automation and automatic volume-control functions are both very useful additions. Now available for Mac OS. Despite some significant workflow refinements, the software interface still doesn't feel quite as elegant or intuitive as I'd like. It's a specialist tool that doesn't provide as wide a range of processes as some similarly priced software mastering suites. As I see it, Harbal represents very good value for money. It doesn't try to be an all-singing, all-dancing mastering bundle, but it's nonetheless enormously useful for both mixing and mastering. I wouldn't want to be without it. £119.53; upgrade from v2 $29.95. Prices include VAT. $175; upgrade from v2 $29.95. Rain Recording Solstice O3 PC with AMD Phenom II X4 810 quad-core 2.61GHz processor and 4GB DDR2 RAM, running Windows XP Pro Service Pack 3.